Do you buy recycled? Recycled-content products are made from recovered materials that come from homes just like yours. Collected recyclables that are set out or dropped off are sorted and then shipped to manufacturers that used them to make new products. Those products are delivered to stores—where you can purchase them. 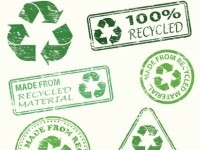 To see some uncommon recycled-content products, visit: www.terracycle.com, www.reusit.com, www.greentoys.com, and www.artofboard.com.